Dug out a folder on the hard disk of my old computer where I had stored many Sankey diagrams. Great stuff there I had saved years ago. Problem is that at the time I didn’t label the diagrams properly, so that I am now trying to trace where I got them from. Alaska Energy Flows for 2006 in trillion BTU. Forget about the other fuels, this state’s energy is almost entirely based on crude. And – despite being an importer of oil – AK is primarily an exporter of oil. All other energy flows really seem to be insignificant because of the dominance of oil. Losses are not shown with streams, but rather are given as text on the node. 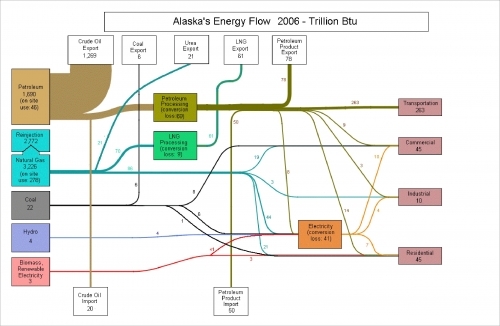 Comments Off on Alaska Energy Flows	Tags: Alaska, energy, oil, U.S.